Pinatamasters is an awesome arcade game developed by Playgendary. Travel all over the world and fight colorful crazy pinatas. 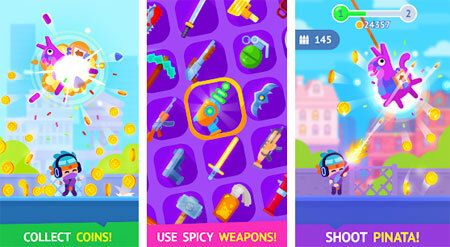 Purchase and upgrade various weapons to become stronger. Smash those cute pinatas, and get all the coins they have. If you get stuck in the game, check out the video walkthrough and gameplay for the game. This entry was posted in Android Games, Mobile Games, Walkthrough and tagged Pinatamasters Cheats, Pinatamasters Gameplay, Pinatamasters Guide, Pinatamasters Strategy, Pinatamasters Walkthrough by Marvin. Bookmark the permalink.